Are Peonies and other flowers poisonous for dogs? Dog lovers know that they have a tendency to chew, play and dig up many of our beloved garden plants. This might seem like little more than an annoyance but there are many garden plants that may poison your dog. Such flowering plants should be avoided in the garden for the safety of your dog. If you love the plant, you can consider fencing around the flowering plant so that your dog will not go near it. The big question is, what plants are poisonous and should be avoided in your garden? Lets take a quick look at a few you should be familiar with. 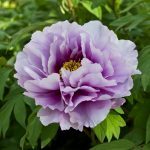 Are Peonies poisonous for dogs? We asked Laverne of GrowPeonies.com and he said “Peony flowers are poisonous to dogs”. Numerous researches have shown that peonies flowers are poisonous to your dogs. Never allow your dog to go to peony flowers. These flowers will greatly affect your dog. They cause vomiting, nausea diarrhea, and loss of concentration. Peony flowers are very poisonous not only to dogs but also to human. Below are other poisonous flowers to your dog. Are Daffodils poisonous for dogs? Daffodils plant blooms very early in the morning. It is highly toxic and poisonous to dogs. This flower is beautiful and among the most colorful in the garden but poisonous! Your dog should not be anywhere close to this flower. To reduce the chances of your dog eating or digging up the plant, you need to cut the foliage back after turning yellowish-brown after blooming. It is important to note that all parts of this flower are poisonous to your dog. When your dog eats a small amount of this flower, it may vomit or diarrhea. Eating a large amount of it may cause serious complications. 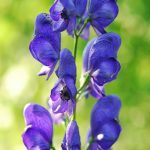 Is Monkshood poisonous for dogs? This wild flower grows and thrives along the edges of woods, gardens and moist meadows. This flowering plant produces white or blue flowers in early summer or late spring. This plant resembles larkspur, grows up to 36 inches in height. All parts of this plant are toxic to dog. Cause abdominal pain and respiratory problems. Never allow your dog to be anywhere close to this flower. It is highly toxic and poisonous. Are Dahlias poisonous for dogs? This flower is one of the most beautiful and gorgeous flowers. Just like peony, this flower is highly toxic and poisonous to dogs. All parts of this flowering plant are poisonous to dogs. Dahlias come in hundreds of varieties ranging from 12-72 inches height. Leaves have red, yellow, pink, purple and orange shades. This flower causes gastrointestinal discomfort and dermatitis after eating any part of the plant. If you have this flower in your garden, don’t allow your dog to approach or go near it. In case your dog eats the flower, take it to the nearest animal hospital or veterinarian. Are Azaleas poisonous for dogs? Azaleas blooms in early spring and late winter. There are more than 250 different species of this flowering plant. It produces masses of very beautiful and gorgeous blossoms. It produces pink, red, white and purple flowers. Some remain evergreen. These evergreen leaves are a threat to your dog. The leaves of this plant are highly toxic and poisonous to your dog. They cause vomiting, nausea, diarrhea, weakness and hyper salivation among others. Never allow your dog to go near the plant especially when the plant is blooming. Does Your Online Pet Store Need An Affiliate Program Manager? There are many brick and mortar pet shops that sell their boutique products on-line to expand their customer reach. Appealing to new customers and standing out from the pack is always something that these sellers need to work on. If you have a unique product to offer, an affiliate program can be a very effective way for you to put an arm of marketers to work advertising your business, you’re products and your special offers. We aren’t just talking about coupon sites either like iGive or Retail Me Not either. 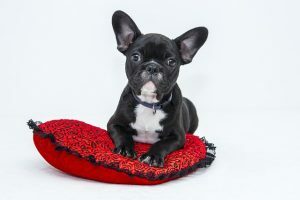 Bloggers especially can be a great way to get your products in front of buyers who are devoted to their dogs and pets. For those of you who don’t know what affiliate marketing is or how it works, you setup a system, either in-house or though a network like Commission Junction to host your program. From there you recruit affiliates who are willing to promote your web store in exchange for a percentage of any converting purchases that you send to their store. While some people might not be comfortable with sharing a percentage of sales, this can be a very cost effective way to get sales that you would otherwise never have gotten. It helps promote your brand and raise awareness about your products. One of the great things about affiliates is that they only get paid when they convert. The big problem that many affiliate programs face though is recruiting the right kind of affiliates for your program. If you’re running your affiliate program by yourself you probably don’t have the experience needed to recruit the best affiliates for your niche. We asked Anne from the Affiliate Management Solutions company, if outsourcing your affiliate program management was the right thing to do for ecommerce sites looking to grow their program. Anne said that there are numerous benefits to outsourcing their program management. First, every business owner knows that they can’t wear all hats, they need to focus in on what they do best and is the best use of their time. Tracking down people who blog about dogs, contacting them and recruiting them to your program might not be the best use of your time. Professionals in the business have the experience in reaching out to these publishers and convincing them that promoting your program will be profitable for them. Secondly, may people who aren’t in the industry don’t have experience in the tools of the trade of be apart of the networks that exist to find and recruit the best affiliates. “I have thousands of blogger contacts that I can reach out to depending on the niche of my clients”, said Anne. Having that network of contacts already established is a huge advantage to programs that want to find new markets to expose their products to. Our recommendation is, if you are just dipping your toes into affiliate marketing and you want to manage your own program to gain knowledge that’s fine. But if you’ve had some success and you want to take full advantage of the possible revenue this form of marketing can bring then hiring a professional OPM might be best for your business and your program.